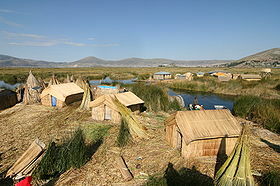 On a number of floating islands made of bundles of dried reeds of totora lashed together, live the ancient Uru people. The Urus not just live on floating islands of reeds but they make their crescent-shaped boats that resembles the ancient Egyptian papyrus boats from the bundles of dried reeds strapped together too. 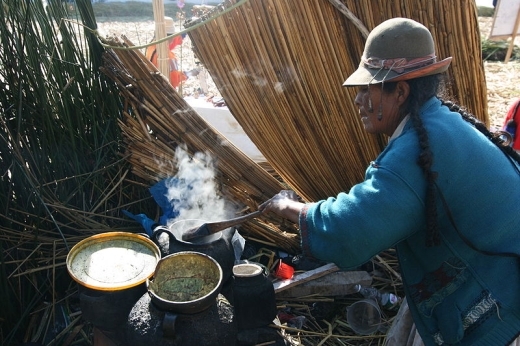 This indigenous community continues to live within the traditions of the 14th century, according to the principles of Inca life, without noting the passing of time, the three golden rules of the Empire of the Sun have been kept, Ama suwa, Ama quella, Ama llulla (do not steal, don't be idle, and do not lie). Contact with other civilisations over the centuries did not destroy the profound identity of the Inca way. The Uros of today, still live as the original inhabitants did as they continue to use the totora reeds to build their huts and rafts. Although they are singular people and even though they keep to themselves very quietly, they do allow people to visit with them. The ruins of a temple on Titicaca Island mark the spot where, according to the tradition of the Incas (The Quechuan people of Peru who established an empire about 1100), the legendary founders of the Inca dynasty, Manco Capac and Mama Ocllo, were sent down to Earth by the Sun. Legend has it that Manco Capac and Mama 0cllo, children of the Sun, emerged from the depths of Lake Titicaca to found their empire. Time in the Incan empire was measured by a thousand year cosmic cycle called an Inti, or 'Sun'. The thousand year cycle was then divided into halves, called the Pachakuti. They also believe in an universal duality that is in permanent opposition, but complementary to each other, much like the Chinese principle of ying and yang, that expresses the opposition between day and night, light and dark, man and woman, earth and sky, up and down. The Pachakutis have their own principle of duality and this is characterised as a time of great changes. During the five hundred years of the eighth Pachakuti was a time of light when the Inca Empire prospered and expanded, when Pachacuteq, the greatest Inca leader and the builder of Machu Picchu ruled. The ninth Pachakuti, brought with it the five hundred years of darkness when the Spanish invaders conquered the Inca and the Andes people lost their power. According to this Inca legend the tenth Pachakuti, will be the returning of Pachacuteq, or the Light, the one we are entering now. This is the time when the mythological city under lake Titicaca will be available to us again. During the time of the Incas, the Solar Disc was held in Cusco, at the Qorikancha, the main Temple of the Sun, where it stayed until the coming of the Spanish, when it was returned to Lake Titicaca and placed in the Eternal City inside the Lake. The Solar Disc was used as a cosmic computer, receiving light information directly from the Universal Mind Source, Wiracocha, at the centre of the galaxy. By entering the Temple of Illumination and opening themselves, the Incas could access the sacred wisdom. It is during this time, the Age of Pachakuti, that the sacred Solar Disc is to be reactivated to access the cosmic wisdom. 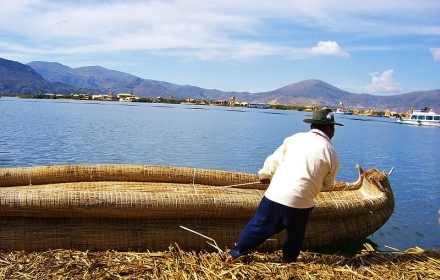 The Uros people believe that the energy of the planet shifted in 1987 from the masculine energies of Tibet to the feminine energies of Peru, and more particular, Lake Titicaca, Machu Picchu, and The Sacred Valley of the Incas. This area is the acknowledged portal through which the new feminine energies are entering Mother Earth 'Pacha Mama". With hesitancy, and gingerly we stepped from our boat onto one of the Floating Islands. We were assured that we will not sink upon stepping onto this floating straw like islands. Old women with large hats and young girls were sitting by their stalls spread out front of us, displaying their goods for us, tourist, that stop by. Stopping in these islands was just part of our day long excursion on the lake, but it was definitely an exciting and memorable experience. Walking on this floating straw islands was strange, a bit disturbing at first but we soon got accustomed to it. At some places we could see spots where the reeds have rotted away, and we were warned to keep away unless we wanted a quick dip in the cold waters of the lake. The more than twelve hours of train ride through the valleys and mountains of the Andes and "training" through the middle of some of the villages was a unforgettable experience. Sightseeing and staying overnight in Puno was another memorable encounter. 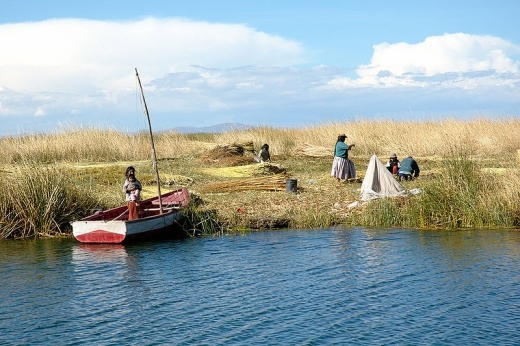 Visiting these floating islands and the Uru people left us with many extraordinary feelings.